Provides the fastest signal identification. Allows quick identification of incorrect provisioning and easy location of the customer's signal path. Ensures a uniform test methodology in an increasingly diverse network. Allows faster installation and responsive maintenance. Distribute firmware updates in the field. Archive pass/fail tests and test results. Document operating- and result-screen bitmaps. Allows visual presentation of measurement results to customers. Correlate alarms, errors, pointer movements, etc. Enables all users (technicians, experts and occasional users) to be immediately productive. Easy-to-see in low lighting conditions. Histogram resolution is clearly visible. STM-0 (51 MBps) is becoming more prevalent in radio links/ subsystems and SDH access systems. Test STM-1/4 payloads in STM-16 ring. Simplified testing for correct error performance compliance on both in-service and out-of-service systems. Thoroughly stress the margins of equipment performance. Verify correct network response at all layers. Set and detect K1/K2 bytes. Generate linear and ring messages to G.841 and G.783. Send standard network messages and monitor network response. Verify protection switching system. Swap between Long Haul/Short Haul trunk testing. Efficiently qualify transport of concatenated 622 MBps data for IP and ATM applications. Focus on new 45 MBps services and video quality testing. Make traditional PDH measurements when necessary. Verify correct provisioning and payload integrity. Monitor PDH services to verify tariffed performance. Add/Drop external 2, 34, and 140 MBps signals to/from SDH containers and induce timing impairments. Generate SDH test signals using customer-generated PDH traffic. Add pointer sequences, test pointer hit tolerance of terminals and desynchronizers. Verify correct PDH multiplexer/demultiplexer service configuration for data and video conferencing. Measure round-trip delay for data and voice services. Verify channel-busy occupancy and utilization. Fully conforms with requirements of new ITU-T O.172 (jitter/wander test sets for SDH networks). DSP engine provides precise measurement filter characteristics - unlike previous O.171 test sets, pointer jitter is reliably and accurately measured. SDH/PDH Jitter and Wander testing from 2 to 622 MBps. Most complete solution in one option supports installed interfaces for both generation and analysis (including 45 MBps). Perform all standard ITU-T SDH/PDH equipment and network jitter/wander tests with quick, simple pass/fail tests. Supports G.783, G.823, G.824, G.825, G.958, G.735, and G.751 specifications. Allows characterization of SDH networks for video applications. Correlate SDH pointer activity with video subcarrier and Hsync drift. 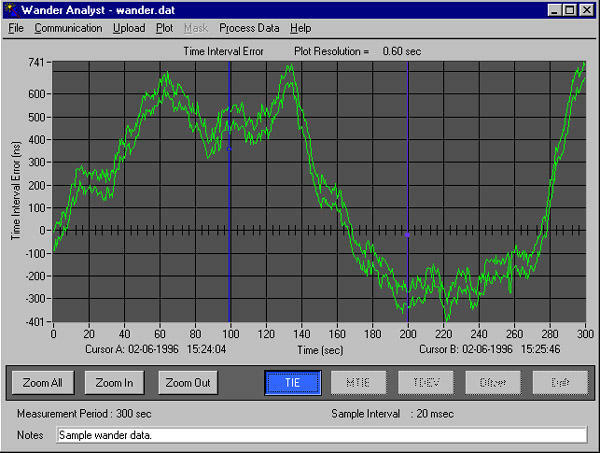 DSP Jitter and Wander measurement technology. Standards requirements can easily be updated in firmware and distributed on a floppy disk. Measurements are more repeatable and reliable between two test sets. Allows existing customers' test sets to be firmware-upgraded to support new O.172. Allows testing of tributary jitter caused by G.783 SDH pointer test sequences together with PDH mapping frequency offset. Enables full margin testing of low-frequency jitter/wander and full input tolerance testing. Test set stays in lock, identifies/logs Pointer Hits on PDH service when dropped from SDH network. Allows diagnosis of network synchronization problems in the field. Ensures reliable and accurate measurements of pointer jitter, improves accuracy of line jitter measurements. Full-band jitter measurement (down to 0.1 Hz) allows characterization of phase transients that affect video, ATM, and PDH service quality. Real-Time Wander Analyst software provides pass/fail testing to the most recent ITU-T, ETSI, ANSI, and Bellcore standards. Also provides frequency-offset and drift-rate analysis. EC Declaration of Conformity - EMC. Class A Radiated and Conducted Emissions. Meets Intent of Australian EMC Framework. Compliance demonstrated to standard AS/NZS 2064.1/2. IEC 801-2, Electrostatic Discharge Immunity. IEC 801-3, RF Electromagnetic Field Immunity. IEC 801-4, Electrical Fast Transient/Burst Immunity. IEC 801-5, Power Line Surge Immunity. Emissions comply with FCC Code of Federal Regulations 47, Part 15, Subpart B, Class A Limits. Low-Voltage Directive 73/23/EEC, Amended by 93/68/EEC. EN 61010-1, Safety requirements for Electrical equipment for measurement, control, and laboratory use. ANSI/ISA S82.02.01: Safety standard for Electrical and Electronic Test, Measuring, Controlling, and Related Equipment. IEC1010-1: Safety Requirements for Electrical Equipment for Measurement, Control, and Laboratory Use. U.S. Nationally Recognized Testing Laboratory Listing. UL3111-1: Standard for Electrical and Electronic Measuring and Test Equipment. CAN/CSA-22.2 No. 1010.1: Safety requirements for Electrical and Electronic Measuring and testing Equipment. Operating temperature: +5 to +40 °C. Max. Operating altitude: 2000 m.
Relative Humidity (maximum operating) 80% for temperatures up to 31 °C, decreasing linearly to 50% at 40 °C. Equipment Type: Test and measuring. Safety Class: Class I, as defined in IEC 1010-1, Annex H) - grounded product. Overvoltage Category: CAT II, (as defined in IEC1010-1, Annex J). Pollution Degree: Pollution Degree 2, (as defined in IEC 1010-1). Note: rated for indoor use only.